Three giant, bubble-shaped greenhouses belonging to Internet retailer Amazon are slowly rising in the middle of Seattle. They're intended to be oases for the employees at Amazon HQ, who have their share of stresses, from Seattle's never-ending drizzle to a hectic work culture. 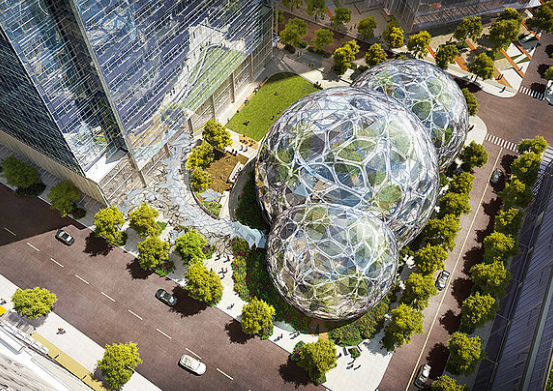 So far Amazon has invested more than £3 billion in its downtown Seattle office spaces, these spherical greenhouses containing more than 3,000 species of plants won't be accessible to the public, because there are offices scattered throughout the area. Even as the likes of Facebook, Google, and Apple invest in their leafy suburban campuses, Amazon is not alone among tech companies looking to provide their employees with urban inspiration and refuge at the same time.